The bakeshop industry in the Philippines has just been tickled by an imaginative business concept when ANTZ The Bread Factory launched “BAKESHOP ON WHEELS” – an onsite baking of fresh bread that will revolutionize the baking industry. This business concept has been uniquely created by Filipino entrepreneurs, and proudly first in Asia. 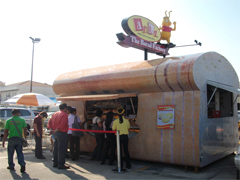 Along with the launch of “Bakeshop on Wheels”, ANTZ The Bread Factory opens business opportunities for budding entrepreneurs and small to medium-scale investors to become FRANCHISEE. As we know, ANTZ The Bread Factory has been popular for years now for its wide array of Antz certified original breads like the all- time favorite Braided Pizza and Mayon Pork Barbeque. Some of the top sellers are swirl muffins , ensaimadas , fiesta buns , flozz , and different varieties of loaf bread, which includes the lip-smacking pandesal loaf -- all baked fresh everyday on the Bakeshop on Wheels.